One of the times I wished I lived in Japan. 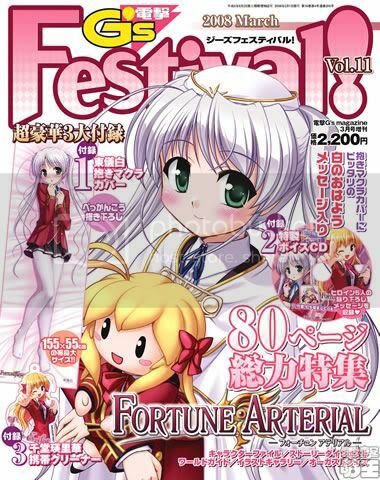 If I did I could just go down to my neighborhood friendly Akihabara (or whichever anime shops in Japan) and grab a copy of Dengeki G's Festival Vol.11. But looking on the bright side, it seems that KKnM did bring it in, and hopefully when I go this Saturday it'll still be there. I just want the Shiro Dakimakura!!! The photos of the loots will be delayed, maybe tomorrow or the day after, but surely before the end of the week. I'm currently half-dead from playing paintball in the afternoon, part of my squadron/flight "cohesion" day. 3 games all clean sweep victories for my team. A song that I'm currently addicted to, but due to it's length (15mins+) it is split into 2 halves. It's a combination of various songs (mainly character songs) from Lucky☆Star. It's really addictive. Enjoy. Signing out.